Andalucia, southern Spain, is well supplied with golf courses. 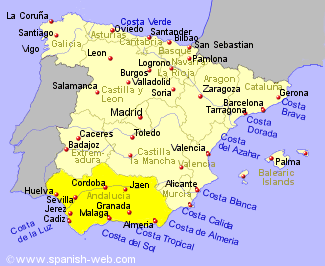 Infact, 25% of all the golf courses in Spain sit in this region with the highest concentrations being particularly on the Costa del Sol, Costa de la Luz, and increasingly, on the Costa de Almeria. It is home to some of the most attractive and prestigious courses in the country which have hosted such as the Spanish Open in recent years. Many of the golf courses situated near the costas are associated with urbanisations or hotels offering a wide choice of accommodation and other facilities such as swimming pools and spas. The inland provinces have a much lower density of golf courses but you will never be too far from one.